Tests in 1988 concluded the cloth was a medieval "hoax"
The Shroud of Turin is much older than suggested by radiocarbon dating carried out in the 1980s, according to a new study in a peer-reviewed journal. It was this material that was responsible for an invalid date being assigned to the original shroud cloth, he argues. "The radiocarbon sample has completely different chemical properties than the main part of the shroud relic," said Mr Rogers, who is a retired chemist from Los Alamos National Laboratory in New Mexico, US. He says he was originally dubious of untested claims that the 1988 sample was taken from a re-weave. "It was embarrassing to have to agree with them," Mr Rogers told the BBC News website. The 4m-long linen sheet was damaged in several fires since its existence was first recorded in France in 1357, including a church blaze in 1532. It is said to have been restored by nuns who patched the holes and stitched the shroud to a reinforcing material known as the Holland cloth. "[The radiocarbon sample] has obvious painting medium, a dye and a mordant that doesn't show anywhere else," Mr Rogers explained. "This stuff was manipulated - it was coloured on purpose." In the study, he analysed and compared the sample used in the 1988 tests with other samples from the famous cloth. In addition to the discovery of dye, microchemical tests - which use tiny quantities of materials - provided a way to date the shroud. These tests revealed the presence of a chemical called vanillin in the radiocarbon sample and in the Holland cloth, but not the rest of the shroud. Vanillin is produced by the thermal decomposition of lignin, a chemical compound found in plant material such as flax. Levels of vanillin in material such as linen fall over time. "The fact that vanillin cannot be detected in the lignin on shroud fibres, Dead Sea scrolls linen and other very old linens indicates that the shroud is quite old," Mr Rogers writes. "A determination of the kinetics of vanillin loss suggests the shroud is between 1,300 and 3,000 years old." In the 1988 study, scientists from three universities concluded that the cloth dated from some time between 1260 and 1390. This ruled it out as the possible burial cloth that wrapped the body of Christ. 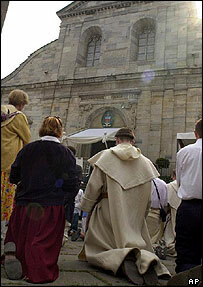 That led to the then Cardinal of Turin, Anastasio Alberto Ballestrero, admitting the garment was a hoax. Michael Minor, vice-president of the American Shroud of Turin Association for Research, commented: "This is the most significant news about the Shroud of Turin since the C-14 dating was announced in 1988. "The C-14 dating isn't being disputed. But [the new research] is saying that they dated the rewoven area." But since the announcement of the 1988 results, several attempts have been made to challenge the authenticity of these tests. "The sample tested was dyed using technology that began to appear in Italy about the time the Crusaders' last bastion fell to the Mameluke Turks in AD 1291," said Mr Rogers. "The radiocarbon sample cannot be older than about AD 1290, agreeing with the age determined in 1988. However, the shroud itself is actually much older." Some now hope the Vatican will give approval for samples of the shroud to be re-tested. But, says Mr Minor, "the church is very hesitant, very reluctant for that to be done, because they've been given so many conflicting opinions". What is your reaction to the new evidence? Do you believe the Turin shroud is Christ's burial cloth or do you think it is a hoax? You sent us your comments. The new research is quite fascinating. However, I wonder why nobody considered the patch idea earlier. And even though I want to believe that it belonged to Jesus, I think it would be better if it remained a mystery. Time heals all wounds, solves all mystery, and buries all truth. There are always two sides to every story. This debate will only be solved after UFOs and the Kennedy assassination. The human nature and nature of humanity that allows us as a mammal to have such relics to debate over is the true miracle. While I find the discussion on this article, and its age, interesting historically, it has no effect on my faith. Trusting that Jesus was the Son of God come to earth to take on a human body, and then crucified taking on the sins of the world, to return from the dead and then to be resurrected to heaven is enough. God does nothing without reason or plan, and I can't fathom His leaving something confusing like this. Unfortunately, some people seem to need or want more. The Bible isn't enough for them. Who cares? Even if it is proven that the shroud dates to c.33AD, what does that prove? Absolutely nothing! It simply proves that you have a 2000-year-old burial shroud. Historically interesting, yes, and relatively unique, but the connection between this cloth and Jesus Christ is stretching the imagination so far as to be ridiculous. Only the faithful will believe it anyway, and those people who need their faith to be bolstered by something as trivial as this need to question why they believe in the first place. The altars of Catholic Europe are full of the interred bones of saints who, if their existence is to be believed, must have had 7 legs and 97 ribs. I think that regardless of whether it is or is not Christ's burial cloth, testing should still be allowed to take place. They only way any truth can be gained from the shroud is through testing it's age again - to get some measure of certainty. The Shroud is one of the most intriguing antiquities in the world. I am excited by this new information. Tradition has often been confirmed by scientific investigation. Maybe, some day, we'll find that the 'story' was true! Whether the shroud is faked or real does not diminish in anyway the fact that Christ died and was wrapped in a piece of cloth. Instead of wasting resources trying to prove what will not add any value to the body of Christ, I feel such resources should be channelled to orphanages and homes where it will help humanity to the glory of God. The shroud of Turin is a masterpiece whether or not it is the image of Christ. I work with fibres and dyes, and the beauty and skill of the image from so long ago is a wonder to behold. How did it happen chemically? When? Treasure it, study it, and enjoy it as any great masterpiece. The eternal battle of science and religion is really fascinating! While science continues to disprove and now prove the Shroud of Turin to be older than the previous results, people's believes get stronger each day, by absorbing science findings as part of the foundation of their religion. 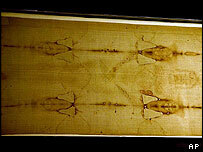 I believe the most interesting fact concerning the Turin Shroud is that it bears blood stains. If so, this would show that Jesus was not actually dead when he was wrapped in it, and that Christian theology has been based on a false premise, and it would enable us to analyse his DNA and identify his descendants. Wow. I would like to look at who sponsored the research - but even if this evidence is correct, it in no way substantiates that the image is that of Jesus. The fact that it appears to be an imprint of a person who died in a similar fashion is not conclusive - thousands died in this unimaginable way around the same period. But as a medical and historical artefact it is no less fascinating. It is a fake. The church probably possesses many other such fakes created by medieval superstition. The church does not need such relics, they belong in a museum. Personally, I do believe the shroud is Christ's burial cloth, and the new proper dating concludes that it does indeed fall within the correct time frame. What should be noted here is that even if we find undeniable evidence that this is Christ's burial shroud there will be always be people that will still vehemently deny this fact. The reasons are many but it mostly comes down to a problem of the heart and choosing to believe or not to believe in the claims that Christ made concerning His identity and the works and miracles of His earthly ministry. This denial has been going on for 2000 years the shroud being dated correctly will unfortunately not change that. I think it could well be Christ's burial cloth, and it should be tested properly now to establish this once and for all before the fabric becomes too fragile. Surely this would be in the interests of Christians worldwide and not just those adhering to the Roman Catholic faith. 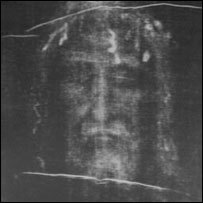 The new evidence is interesting in what it may say about the cloth, but as a Christian I've never been surprised at any test showing that the Turin shroud was not Christ's burial cloth. In John 20:6-7, the cloth wrapped around Christ's head is clearly separate from the strips wound around his body, so any cloth showing both head and body (as the Turin shroud does) can't be the real thing. I don't see what difference it makes. Those who believe will not be convinced otherwise and vice versa. In my opinion, it is unlikely that it is the shroud, like the lance and the grail and all the other things associated with Jesus. It will never be proven one way or another, as there is no DNA to measure it against.